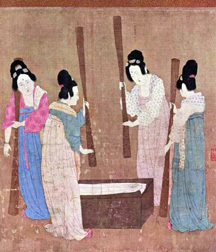 This section emphasizes womens vital role in the production of silk, a product which helped contribute to the economic strength of China, Central Asia, and Byzantium. In a larger sense, it can be used to demonstrate womens role in economic production throughout history.  Why might the making of silk have become part of womens work?  What does learning about womens responsibility for the silk-making process have on our view of women s role in history? Background: Silk was invented in China ca. 3000 BCE. By the Han Dynasty it was well integrated into the Chinese economy. Plain silks, products of peasant households, were used as the main form of tax paid to the government. Fancy silk textiles were worn or displayed by the wealthy as symbols of status from the Han Dynasty on. 1Dieter Kuhn, Textile Technology: Spinning and Reeling, in Science and Cilvilization in China, Joseph Needham, ed. Cambridge University press, 1988. Producing silk is a lengthy process and demands constant close attention. The worms need a certain degree of warmth to survive. Sometimes the tiny eggs were sewn into little cotton bags and worn beneath each womans clothing. When hatched, they might be placed in shallow baskets, or on racks in the house, and fed fresh mulberry leaves night and day. When they become cocoons, dipping them into hot water to loosen the tightly woven filaments, then winding these filaments onto a spool to produce the silk threads woven into cloth or used for embroidery, was also womens work. Today, silk factories still mainly employ women for these tasks. The Secret of Making Silk is Out! : The use of silk was confined to China until the opening of the Silk Road. Starting in the 4th century BCE, silk began to reach the West by merchants who would exchange it for gold, ivory, horses or precious stones. Though silk was exported to foreign countries in great amounts, sericulture (the raising of silkworms in order to obtain raw silk) remained a secret that the Chinese guarded carefully, letting the empire maintain its virtual monopoly. Shortly after 300 CE, however, the secret of making silk reached the West through a number of different channels. There are wildly varying tales of the way it was spread to the world, and again women were involved. One story, told in various versions, is about the Chinese princess who smuggled out silkworm eggs into Khotan by hiding them in her voluminous hairpiece. Promised to a prince of Khotan, it is said that the princess refused to go without the fabric she loved, finally breaking the imperial ban on silk worm exportation. However it happened, both the Byzantines and Arabs had begun to manufacture silk by the early sixth century. Even so, Chinese silk exports still maintained dominance over the export market of luxury silk fabric and thread to Europe and the Near East along the Silk Roads. Eurasian Women Weavers: Textiles always have been an integral part of the lives of Central Asian people. The passion for luxury textiles infused the courtly life of the khans, but even within the hard lives of nomads every object from prayer rugs to cradle covers to bridal gowns, was beautifully woven and decorated. Women did most of this work; embroidery and applique in wool, silk, cotton or felt became their specialities. The introduction of silk made a significant impact on these societies. By 300 AD, women in central and western Asia were using Chinese silk thread with most woven silk fabrics. After the knowledge of making silk spread, women from almost every household raised their own silkworms, and sold the best quality cocoons in the bazaar to make silk cloth. By the sixth century the Persians, too, had mastered the art of silk weaving, developing their own rich patterns and techniques. Later, the Mongol rulers not only enjoyed silks, but profited from them as well during the height of the trade in silk in the 13th and 14th centuries. 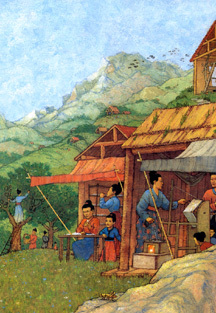 They took over the regions silk factories, established new ones, and gathered silk brocade cloth though booty, tribute, and taxation. Byzantium and the West: Persian monks or travelers brought the secret of silk cultivation to Byzantium sometime in the 6th century, during the reign of Justinian. Eventually the Byzantines perfected their own silk-making techniques, transforming cities like Damascus, Beirut, Aleppo, Tyre and Sidon into famous centers of silk production. Even after the coming of Islam, these remained as major cities from which medieval Europe obtained its luxury fabrics. Like the Chinese, the Byzantines tried to maintain a silk monopoly on silk. To do this they created state owned imperial workshops. Both male and females were employed in these silk workshops. Some were staffed entirely by women, who were not allowed to leave and thus spread their skills to rival nations. This did not always work. Tales tell of women silk weavers in the Byzantium city of Thebes being carried off to work in the Sicilian silk workshops when the Normans sacked the city in 1147. Important Essay for the World History classroom by Robert Shaffer from the World History Bulletin, Fall, 2008. Short essay which includes a number of legends about the discovery of silk in China involving women. Also, facts about the silk road. How to rear silkworms in the classroom or at home. Links to classroom silkworm lessons, the role of rural women rearing moths, and contemporary womens work in China and Cambodia. 5) Legend of Silk Princesses: Two Versions. Video which includes images of the painting illustrating the tale of the princesses, a Uighur silk dance with the female dancers carrying plates of cocoons in honor of the Silk Princess, scenes of mainly women at large looms making rugs. Impressions of the work of women in the silk carpet and textile factories in modern Hotan (Khotans old capital) by Elisabeth28 from her April 2006 trip. Some photos. Short history of Ikat silk weaving in Usbekistan. Photos of women, gender differences in production of cloth. Article about Central Asian silk weaving which refers to lengthy tradition of textile production, and fact that sericulture and all woven silk fabrics began through the work of women.